Jeffrey D. Forchelli founded the law firm which is now known as Forchelli Deegan Terrana in 1976 and has served as its Managing Partner ever since. His extensive personal practice concentrates on complex real estate and land use matters, including litigation and tax certiorari for major real estate developers and national corporations. He is a Trustee of Brooklyn Law School and formerly served as a Trustee of Wagner College, where he also served as the Vice Chairman of the Board. He served as a Counsel to the New York State Assembly, as a Director of Security Title and Guaranty Company, and as a captain in the U.S. Army Judge Advocate General (JAG) Corps. 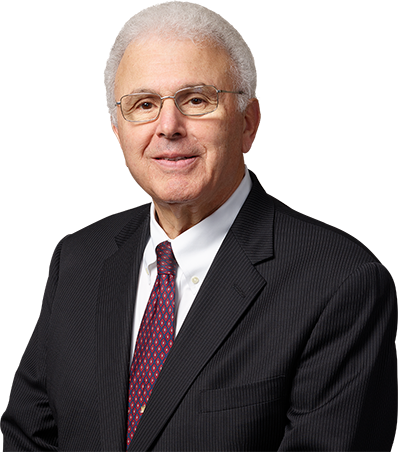 Mr. Forchelli was selected for inclusion in Who’s Who in American Law (8th Edition) and is consistently included in the “Who’s Who in Law” listing by Long Island Business News. He was selected by his peers for inclusion in New York SuperLawyers . In 2017, he was selected by his peers for his inclusion in The Best Lawyers in America. In 2003, Mr. Forchelli endowed his first chair at Brooklyn Law School. He later endowed a second chair in 2004 in honor of his father, Don Forchelli, who was also a lawyer. In 2005, Brooklyn Law School celebrated the opening of the school’s Jeffrey D. Forchelli Conference Center, named in his honor. He also received the National Alumni Association Award for “Excellence in Business” from Wagner College. In 2009, Mr. Forchelli and his wife Sadie were honored by St. Francis Hospital at its annual Challenge Ball. Under the auspices of the Diocese of Brooklyn, he was the recipient of the 2011 Frederic Ozanam Award. He has been honored by Hempstead Plains at Nassau Community College, The Center for Developmental Disabilities, the Nassau County Bar Association’s WE CARE annual Golf and Tennis Classic, and The INN—Interfaith Nutrition Network. Forchelli Selected for Inclusion in The Best Lawyers in America 2019. Jeffrey D. Forchelli, Managing Partner, Honored by The Center for Developmental Disabilities, Inc.